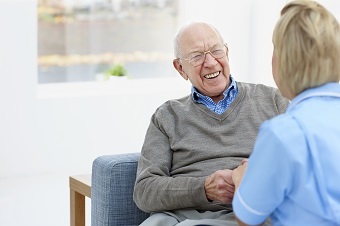 The Short-Term Restorative Care (STRC) Programme is an early intervention programme which aims to reverse and / or slow ‘functional decline’ in older people and improve wellbeing through the delivery of a time-limited (up to 56 paid days), intensive, goal-oriented, multidisciplinary and coordinated range of services designed for, and approved by the care recipient. STRC services can be delivered in the home, the community, an aged care home, or a combination thereof. are not receiving a Commonwealth subsidised home care package, residential care or transition care. at risk of losing independence to such a degree that, without STRC, it is likely that the person will require home care, residential care or flexible care provided through a multi-purpose service. receive more than two episodes of short term restorative care in any 12 month period if they receive the proposed episode. How can someone access STRC? To receive STRC services a person will need to be assessed by an Aged Care Assessment Team (ACAT) assessor and approved for STRC by an ACAT delegate. To arrange for an assessment, prospective care recipients (or their nominated representatives) need to contact My Aged Care on 1800 200 422 between 8am and 8pm Monday to Friday and 10am to 2pm on Saturdays. refer an existing patient to My Aged Care so they can access information on ageing and aged care, have their needs assessed and be supported to locate and access services available to them. be engaged to participate in an STRC MDT to ensure that underlying health conditions are diagnosed, treated, and considered during care plan design. Participation in MDTs may be through phone consultation / written collaboration and may not include or require face-to-face involvement. Northern Sydney has been allocated 26 eight-week packages in 2016/17 and a further 13 eight-week packages in 2017/18.